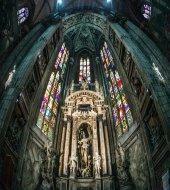 Visit the symbol of Milan: The Cathedral! You can’t leave Milan without visiting its majestic cathedral! On the tour you will be introduced to the history of this gothic masterpiece, with its countless paintings, statues and stained glass windows. You will discover fascinating legends and hear the hidden stories behind this beautiful church. The tour ends with the visit of the basement and the impressive crypt under the altar where the ancient tomb of the archbishop Carlo Borromeo is located. Only visitors with proper attire are permitted to enter the Cathedral: sleeveless shirts, shorts, skirts, and hats are prohibited. The crypt is not accessible for people with disabilities.